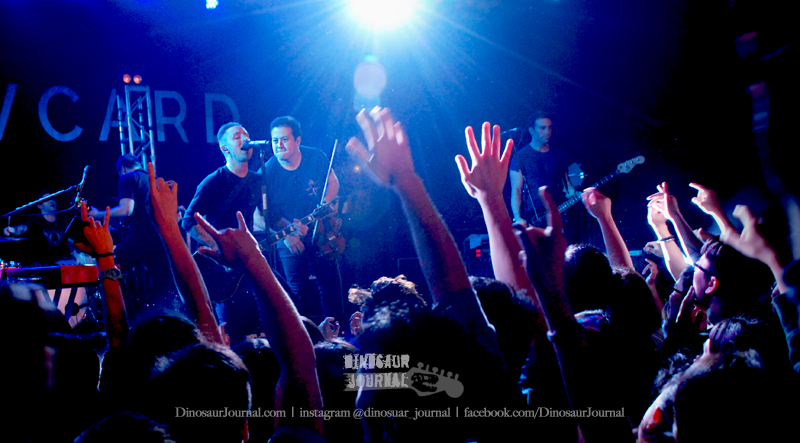 2014’s live gig journey comes to an end as Yellowcard pulls back the curtain. The long-awaited pop punk titans debut their show in Hong Kong 11 years after releasing their global hits Ocean Avenue. Now is definitely not the time of pop punk era, but it’s still a great opportunity for the now-grown fans in their mid/late 20s to revisit the lost teenage dreams. Last month, the band come back strong with Lift A Sail, an album full of positive vibes inspired by frontman Ryan Key’s personal tragic experience (Key’s wife became paralyzed in an accident). You know what to expect in their promotional tour by looking at its cover – colors, transformation, hope. It’s our third time seeing Yellowcard in live – New York, Chicago and now Hong Kong. They always bring in the same fierce live energy and affinity regardless the fact of growing from angry teenagers to calmer family men. Ryan Key expresses they feel extremely exhausted at this show because they only get to sleep for two hours with the tight schedule. They even joke about having to rely on Red Bull and beer to keep their bodies running. It’s kind of obvious that Ryan Key doesn’t have as many moves and his signature athletic jumps as he did in the old times, not sure if it’s due to exhaustion or it’s his matured style of performance. On the other side, violinist Sean Mackin has been acting extremely hyper throughout the concert — back flip jump, bounce around, lunge, cheer fans up and encourage them to sing along — just everything you’d want your favorite rockstar to do. It’s encouraging to see Sean rocking out again in good shape after recovering from thyroid cancer. This is also Yellowcard’s first overseas tour after the departure of original drummer Longineu W. Parsons III. The set is composed of equally old and new materials. The relatively soft, electronic-fused songs off Lift A Sail act like buffer between their straightforward, triumphant anthems like Only One and Way Away so the rhythm moves like wave. Ryan Key dedicated a solo of California with keyboard to his wife that brings tears in your eyes and goose bumps on your skin. If you are part of the old emo / pop punk community, you’ll find this night quite sedimental with all the joyful memory Yellowcard brings back to you. While for the younger generation, you’ll still be filled with happiness by their upbeat pop punk delights. Time doesn’t seem to have much influence to Yellowcard, except getting more experienced on how to put out a show and build a better bonding with their fans. The rebellious message of unsatisfaction towards life seems to be replaced by acceptance and reborn in their musical presence. Just as their album said — With the last sail lifted high, I am ready now. See you all in the pit in 2015.